Was not going to publish a post today because of photos mishap. Deleted some photos by mistake with no way to recapture the images and the photo of the finished dish I made was not the best looking but tasted really good so decided to publish. Lacking a root cellar, during fall of 2012 I decided to experiment with storing my root vegetables (buried using pro-mix) in window boxes in my unheated garage. All the root vegetables stored well, a successful experiment. So last fall, 2013, I expanded my storage containers by using large foam ice chest. 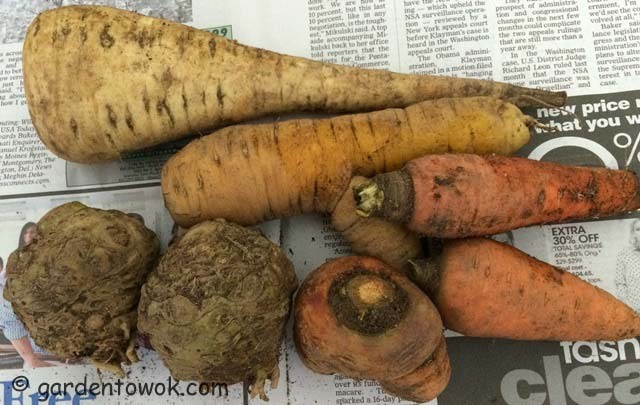 As you can see from the photo below, all the root vegetables look freshly dug. Decided to use the small celeriac first as they will most likely not keep as well as the larger ones. Now that the days are getting longer and the weather, hopefully, will be gradually getting a bit warmer, I need to check all the roots more frequently for growth or spoilage. Whenever I make a stew, be it beef or pork, I always make extra for the freezer. When the stew is cooked to the stage to add the vegetables, before doing so, I remove the extra, cool and package in meal-sized portion, date label and freeze. 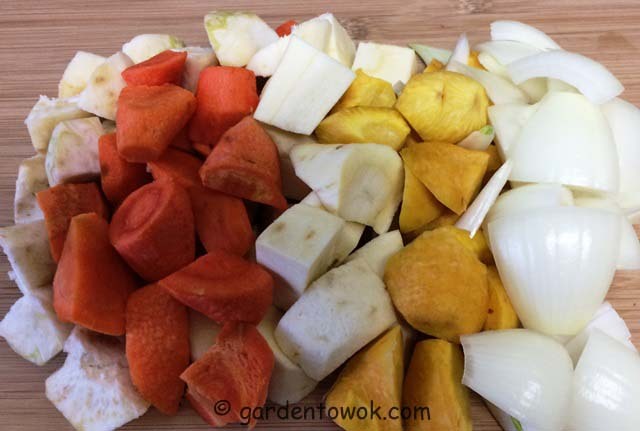 Add the vegetables to the remaining stew in the pot and finish the cooking. That’s why there is no recipe for the dish below. I thawed a package of pork stew from the freezer, added it to a pot with the above prepared root vegetables. There was not enough liquid from the thawed stew so I added a cup of broth. Covered pot and brought to a boil using medium high heat. Lowered heat and simmered until vegetables reached desired doneness. Easy, convenient and best of all did not taste like it came out of the freezer. Was a busy week and completely forgot about the 2 pineapples I bought earlier in the week, when I remembered they were at the point of: use immediately or discard. Enjoyed a large bowl of freshly sliced and oven dried the remainder. Decided to cut some of the slices about ¼ inch thick and some about ½ inch thick. Place all on 2 racks on 2 sheet pans, baked at convection 225°F for 3 hours. Left a crack in the oven door during the 1st hour of oven-drying to allow steam to escape (this is an experiment). My theory behind the above experiment is: during the 1st hour of oven-drying, the pineapple slices release a lot of moisture. Leaving a crack in the oven door allows the moisture to escape resulting in a drier oven cavity thus shortening the drying time. Perhaps I should leave a crack during the whole oven-drying process. What do you think? Sure wish I had 2 ovens to make comparison. Would so love to work in a test kitchen. Also used a higher temperature, convection 225°F instead of convection 200°F. The thinner slices were dry but still pliable the thicker slices were dry to the touch but still plump. Because there is no preservatives all will be stored in the freezer. • Will combine, when the occasion arises, the thinner slices with the oven-dried apples, persimmons and banana I have in the freezer together with some almonds, walnuts and pecans to make a healthy trail mix. Chocolate is good for you so I will add some too. • Will use the thicker and plumper slices in cooking or add to salads. This entry was posted in Harvest Monday, Recipes and tagged carrots, celeriac, onion, Oven dried pineapple, parsnips, Pork Stew with Root Vegetables, root vegetables, winter storage. Bookmark the permalink. Thanks, you made me feel a whole lot better. You are so cute Norma! I’ve inadvertently deleted photos too, thank goodness for time machine (a Mac back up system). Great way to freeze stews, frozen veg gets so spongy, it’s a terrible texture. I really appreciate your freezer tips. My freezer is filled with soups, now that we’re home for lunch it’s quick and easy. The storage for the root veg is quite interesting too, great tip. To protect the surface that your pot/container will be sitting on and also for better drainage you may want to look into “pot feet”. If your container is very deep consider placing a few inches of foam peanuts (make sure they are the type that will not dissolve) in the bottom of the container, cover the peanuts with a layer of landscape fabric (this is to prevent potting mix from migrating into the peanuts) then fill with potting mix, this will make the container a bit lighter. Feel free to contact me anytime if I can be of any help. Thank you kindly for the advice, I actually want the pots as heavy as possible so the wind won’t blow them off the roof. The urns I have out by the front door have bricks in the bottom so they don’t tip over. The old metal ones were heavy enough but these new ones are plastic and have no weight to them. Putting bricks in the bottom also limits how much earth I have to use. The pot feet are a great idea! You are welcome. You may want to fill the empty areas around the bricks with foam peanuts and then put a piece of landscape fabric on top to keep the potting mix from getting through. I hate it when I delete photos or when the memory card does a whack job and nothing is viewable. I usually find that out after we’ve eaten whatever it was I photographed. You and other readers made me feel a whole lot better, thanks. How difficult is it to clean the dehydrator’s screens? Photo dramas…thanks for admitting to them!!! The idea about storing food in the garage in large foam ice chests is great. Think I will try it next year after I’m at the farm…so much to keep and nowhere to keep it!! I did get tired of drying, cooking and canning. I live in a tri-level and the lowest level is fairly warm so it’s even been a challenge to keep the onions, potatoes and garlic. This is a great plan for next year. I will let you know of my success!!! If your garage is a stand alone one and you live in a cold region it may not work as the stored items may freeze. My garage is unheated but is under the house so stored items do not get frozen. My garage is a stand alone…I’ll keep that in mind. Thanks, guess I missed my calling. Thanks. You and other readers made me feel a whole lot better. I LOVE root veggies, Norma. The stew look super duper yummy! Have to try your oven dried pineapple. Thanks. Looking forward to see what you do with oven-dried pineapple. You probably get a better texture with your veggies than I do in stew. I always just cook it up, veggies and all and then freeze it. But I like frozen meals that I can pop into the microwave and eat immediately. I sometimes do that too, toss everything in, except for potatoes. It is a whole lot simpler. I don’ do frozen meals anymore, it’s either I forgot to use them or I don’t like the texture and taste afterwards, I’ll have to try your method of freezing just the meat and add veggies at reheating. By cooking the veggies with the thawed precooked meat the day of serving, gives the dish a fresher taste, hope you finds this method to your liking. So glad you posted after all. I’ve totally done that – you’re not alone. Really good idea to just freeze the meat. I find on my vegetarian bean stews the texture is a little affected. They become more mealy and mushy I find. And love the dried pineapple! I find the texture for my bean stews are not affected if I use chickpeas sprouts. Norma, I would love to see a little tutorial on what you have done to store your root crops in the garage. We have been looking for a way to store more potatoes without a root cellar for years. We love to grow our own spuds but the longest we have been able to keep them in the basement is early December. I’d love to hear more!! All I do is place a layer of pro-mix in the bottom of a foam ice chest, stack the unwashed root vegetables on top, cover with pro-mix and place along the outer wall of my unheated garage. My garage is under the house, one wall is attached to the house the other outer wall is not and is colder. Thanks Norma we will have to give that a try next year. Can I ask what pro-mix is? Just compost or potting soil? Pro-mix is a soilless potting mix. I buy mine from my local garden center. I understand it is the potting mix used by many professionals. Such a great idea on how to store the root vegetables! Thanks. But why did it take me so long to get to this point? Guess it is better late than never. Thanks. A good week to you too. Well I love your tip about freezing stews and adding the veggies later. Would never have thought to do that. And your pineapple experiment looks terrific and I’ll bet they’ll be great in salads. Karen is right, you should have been a scientist…well, really you are a food scientist at that! Thanks. As I said to Karen, missed my calling. 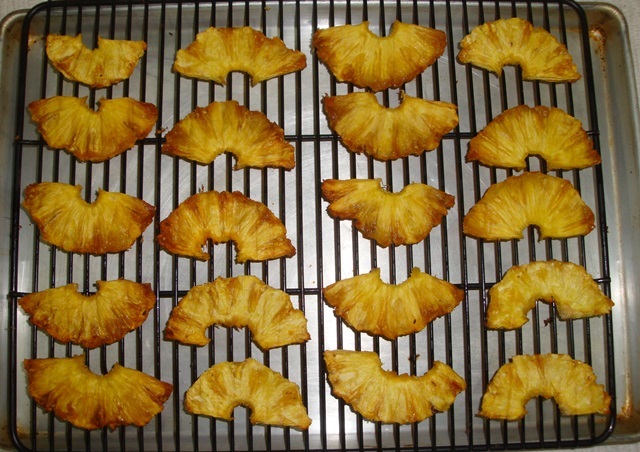 I have been nibbling on my oven-dried pineapple and may not have any left for other purposes, may have to make more. Thanks. Wished I thought of this storage method years ago. I am going to adopt your “instant” dinner term, love it. I can completely relate to the photo issues. I have them often! Your stew looks so inviting. I need to remember to try drying pineapple in the oven. I just put some in the freezer. Probably going to use them in smoothies. I was going to cut the pineapple in chunks and put them in the freezer as they do freeze well and I like to eat the chunks partially frozen especially during the summer, but I ran out of freezer space and decided to experiment with oven-drying and like the results a lot. Well done on good storage of your root veggies Norma and both your pork stew and dried pineapple look fantastic. Thanks. Wish I had this food storage idea a few years earlier. Wow, lovely root veggies Norma! Thanks. May be you can try growing them yourself, they will not take up a lot of your garden space. I will have to dry some pineapple in my oven soon too–looks easy and delicious!! It is surprisingly easy and I love the concentrated flavor and texture. Oh my goodness, that pork stew was calling me to make it immediately. I LOVE LOVE LOVE it. It tasted better than it looked in the photo. 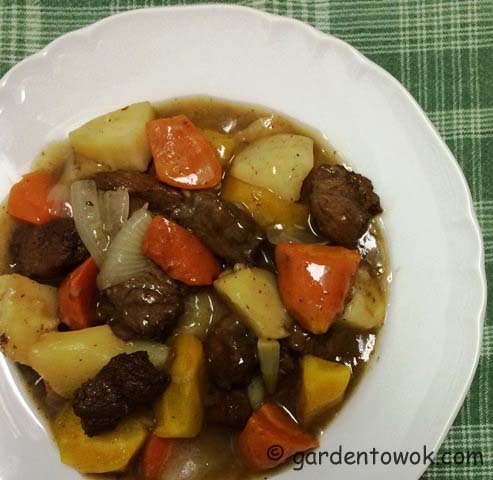 Norma your stew looks so rich and delicious and with your home grown root vegetables I am sure it was delightful. I have never tried to oven dry fruits but that sounds like a great way to do it as I do not own a dehydrated. Your posts are always so fun as I get to watch you through the seasons just like a real farmer going from the seeds, to planting to harvesting and then into a meal. Have a super weekend and wishing you an early happy Chinese New Year. Kung Hei Fat choy! Xin Nian kuai le! The stew did taste better than it looked in the photo. Thank you for your kind words, I enjoy my garden and am always amazed at the results I get from a tiny seed. To you as well, Kung Hei Fat choy! Xin Nian kuai le! Get me that pork stew!! Always love reading your posts because they are so honest to the seasons. And you are right, often times, it’s impossible to write a recipe, because the dish is just the result of having fun with the great produce and ingredients that you have available to you. ps Gong xi fa cai! Thanks, glad you enjoy my posts and have an understanding of the challenges of posting recipes. Gong xi fa cai to you as well. Ah Norma, how annoying that you lost the photos! Your pork stew looks and sounds very delicious! Thanks for stopping by and taking the time to leave a comment. Yes, it was annoying but it could have been worse.